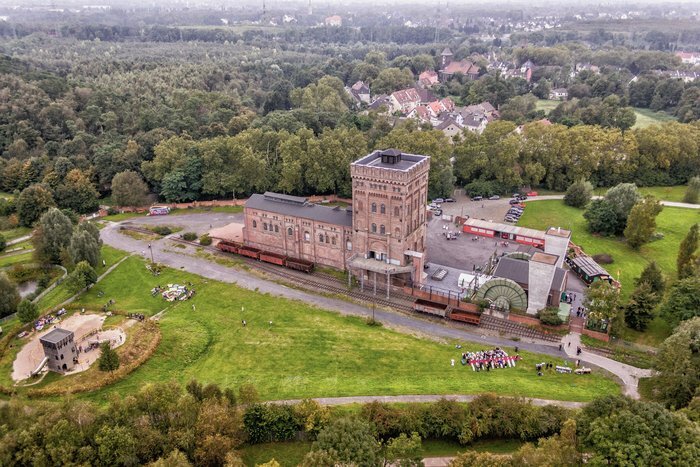 Previously I wrote about Germany’s abundant and well-funded industrial heritage sites where disused rust-belt facilities are repurposed into multi-use parks with landscaping, nature, culture and recreation coexisting among the dramatic metal and concrete relics. 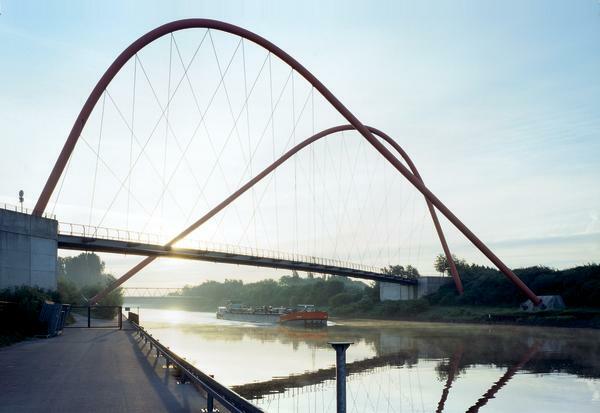 Here I will cover more of the remarkable architecture both new and old. 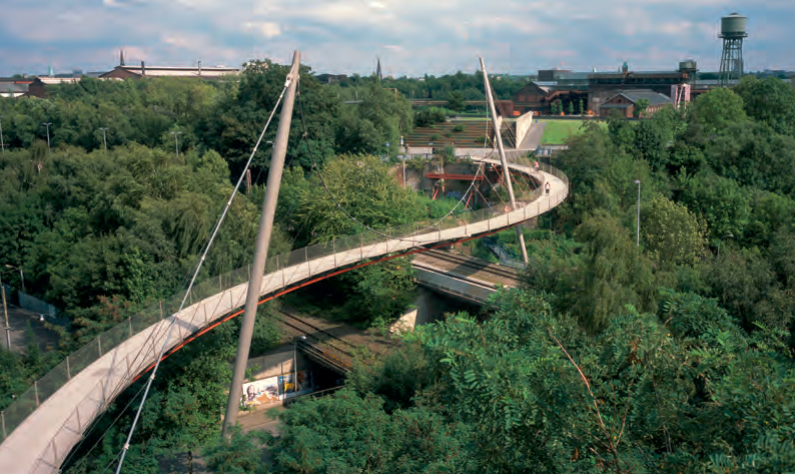 In many sites striking new pedestrian / bike bridges connect public spaces that are separated by roads, rivers and other obstacles. 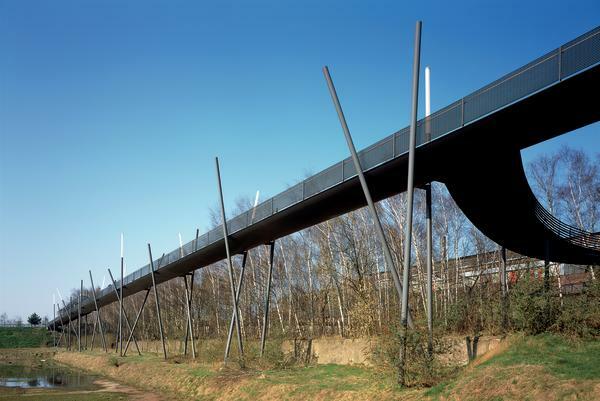 They help make up for the country’s otherwise abysmal modern architecture which stands in sad and ugly contrast to the rich variety of fresh and exciting buildings in pretty much every other western European country. 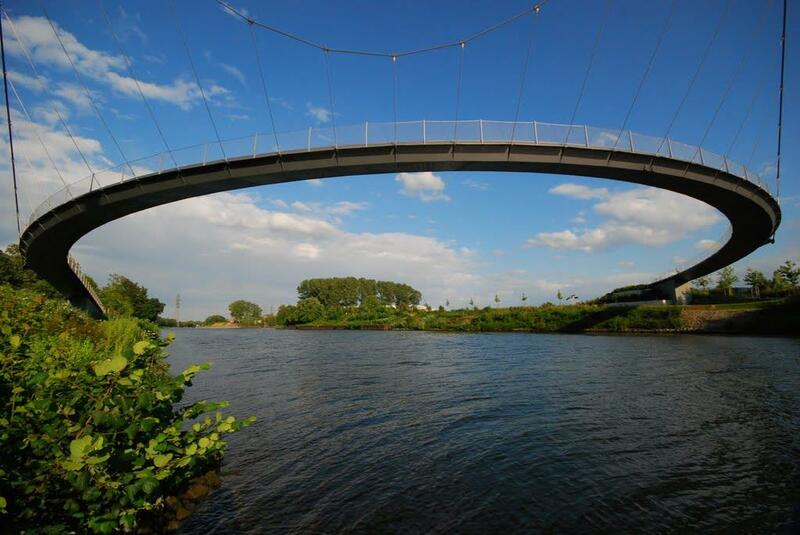 The first one is a unique type of drawbridge in Duisburg that stretches up to lets boats pass, without opening as such, like one of those stretchy watchbands made of metal links, or a cat’s back, which has earned it the nickname “cat’s-hump”. 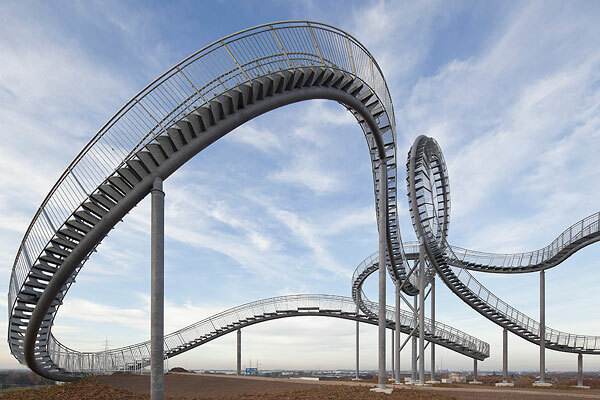 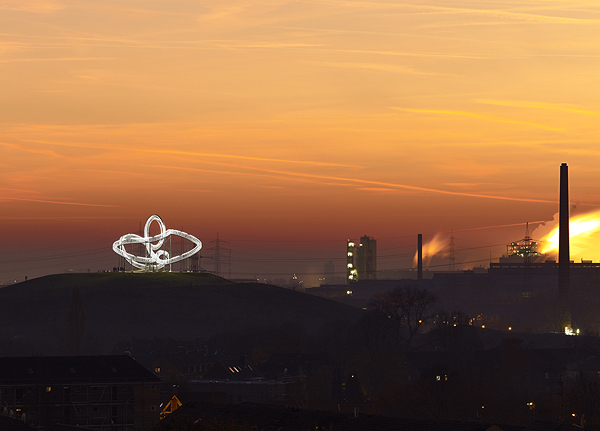 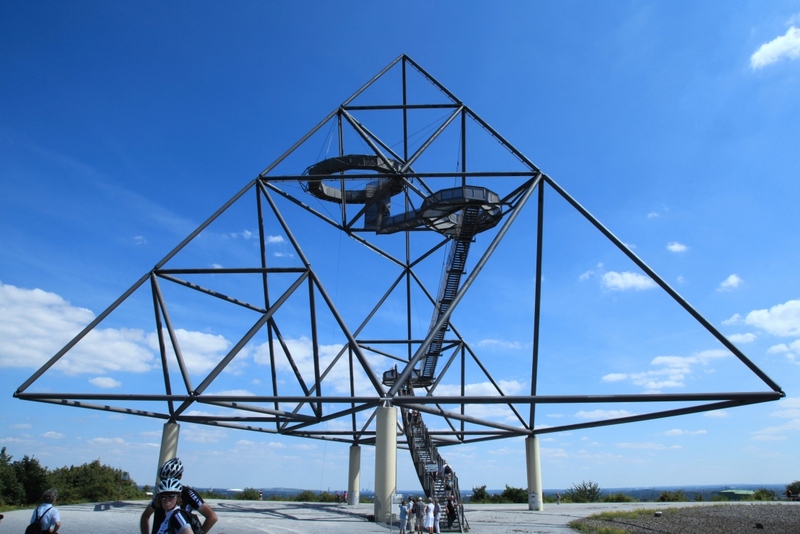 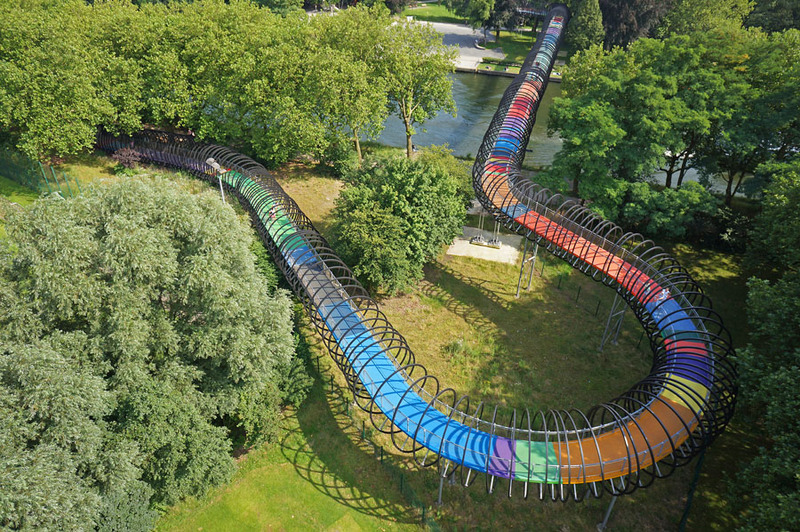 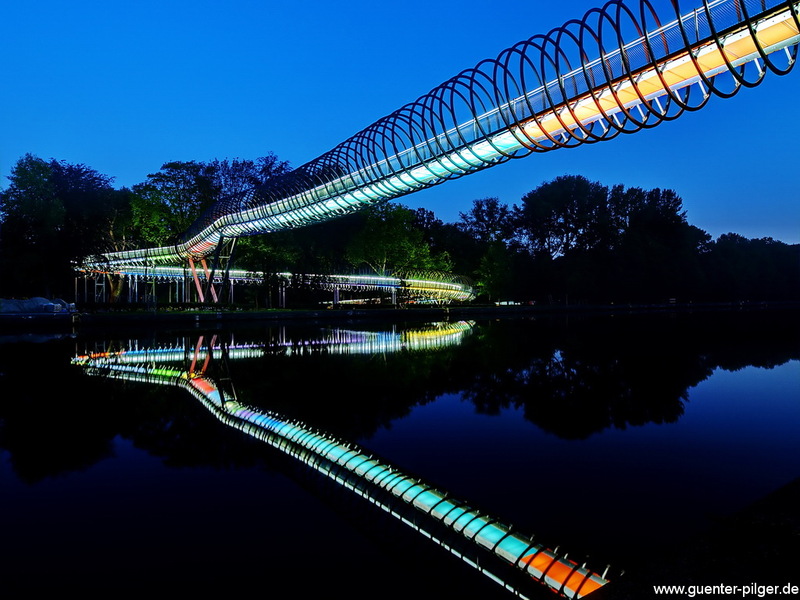 Duisburg also has this sculpture/installation which is a looping staircase to nowhere in the form of a rollercoaster, built on a former zinc smelting slag heap purely as art, or an architectural folly. 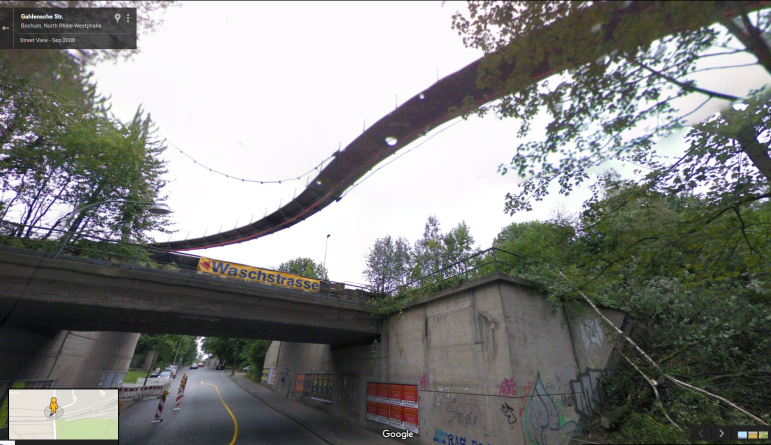 You can walk on the stairs up to the point where a small waist-high bar politely prevents you from going farther. 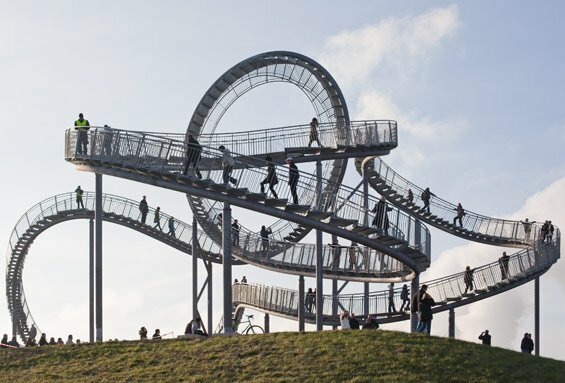 I can’t believe people haven’t fallen and broken their necks trying to climb up and then sued the town for $20 million but that must be my American litigation mindset. 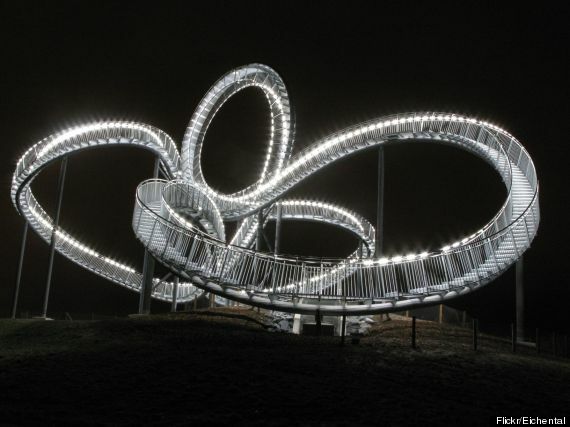 It’s lit up in blazing white at night and is made from zinc-galvanized metal as a sort of memorial to the defunct zinc industry. 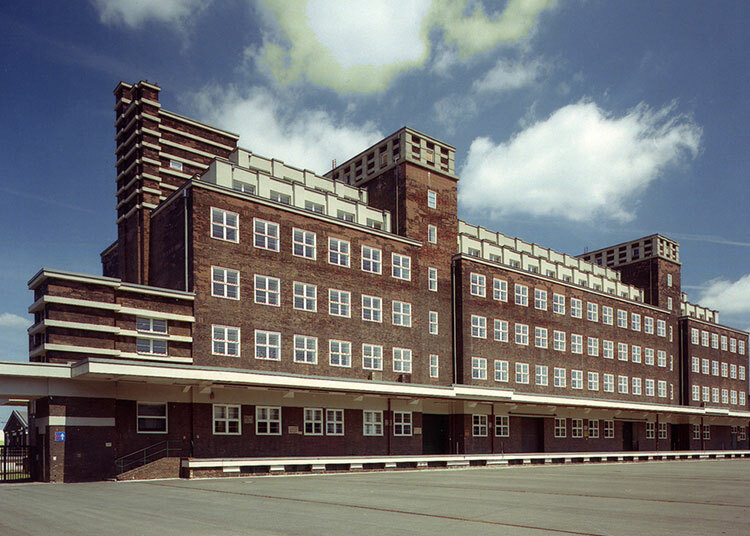 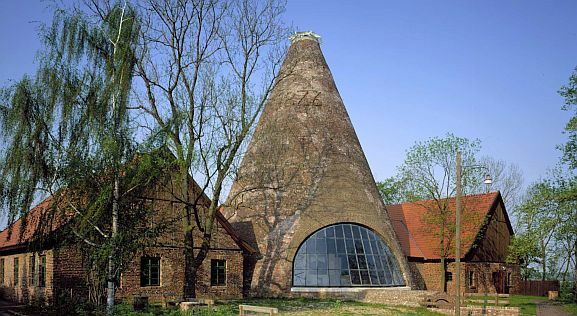 Finally, here is an assortment of other industrial heritage structures, some recent additions and some historical, including a major work by Bauhaus forerunner Peter Behrens. 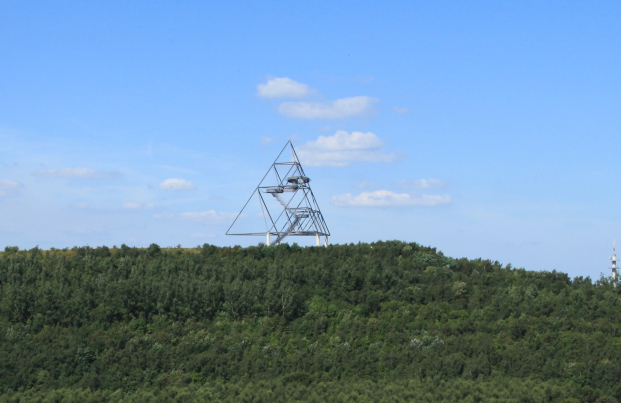 I don’t really like the tetrahedron, which contains a viewing platform, but I put it here anyway. 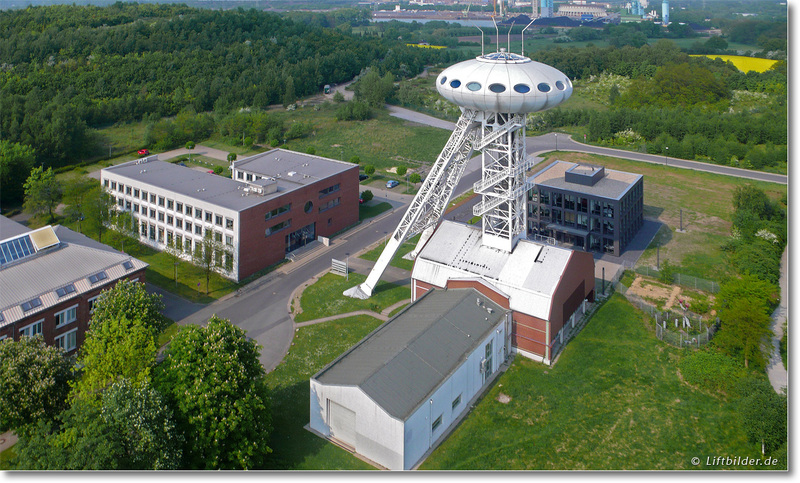 This flying-saucer shaped thing was built in the 1990s in the town of Lünen on top of the headstock, or winding tower, of yet another disused mine whose buildings were renovated into an office park. 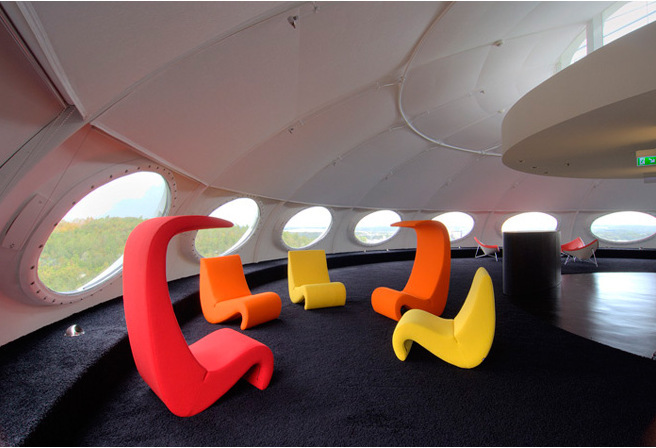 The design very closely resembles Matti Suuronen’s prefabricated Futuro house from 1968, which is something of a cult favorite among 60s design fans and of which around 100 were built. 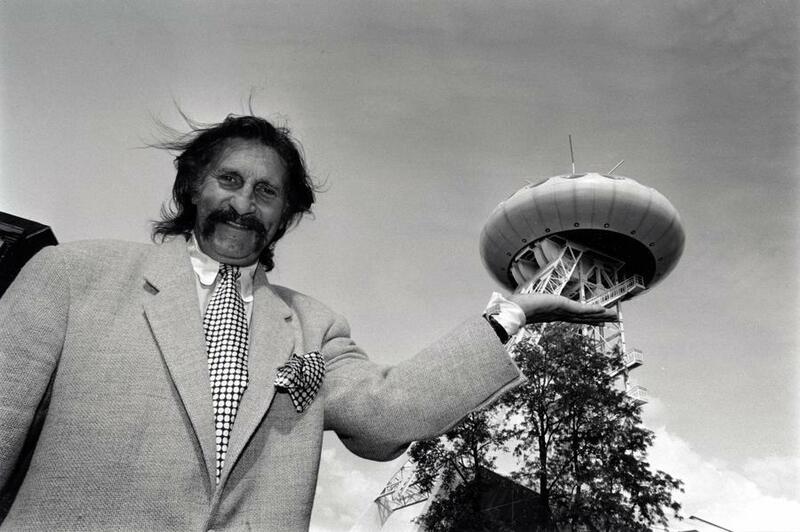 The exuberantly incongruous mine-top building is by Luigi Colani and has subtle differences from the Futuro. 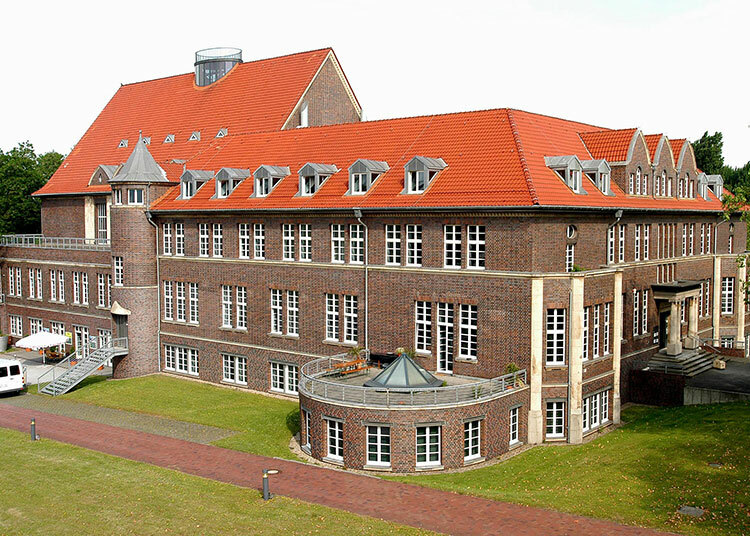 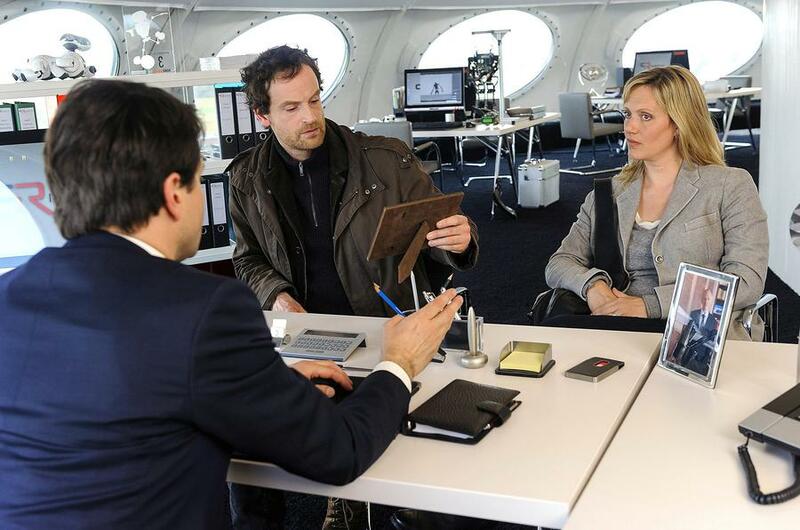 Parts of an episode of the much-loved crime TV series Tatort were filmed in it.